The ever growing rate of active smokers in the country has been linked to the inability of the federal government to impose heavy taxes on tobacco products, which have consequently made the price of the products easily affordable for all. This was the position of an expert on Tobacco Control, Akinbode Oluwafemi who was speaking at a one-day workshop organised for journalists on the role of the media in the campaign against smoking of cigarette in public places in FCT held in Abuja. Akinbode posited that if heavy taxation could be imposed on tobacco by the federal government, the cost of production will increase and this will invariably lead to the increase in the price of the products thereby discouraging youths from smoking. He said, “A pack of cigarette that sells for N200 in Nigeria goes for about $5 in the United States of America due to the heavy taxation placed on the manufacturing companies and I can assure you that smoking is a sure gateway to drug addiction. Akinbode who described smoking as a major risk factor for different cancers and other tobacco related ailments said it was also linked to about fifteen various cases of cancer in the human body saying “apart from the high cost of treatment, infrastructural challenges, smoking related cancers accounts for 30 per cent of cancer related deaths” . The expert who is the Programme Manager, Environmental Rights Action/Friends of the Earth Nigeria disclosed that studies had revealed that cigarette contains about 4,000 toxic and cancer causing chemicals and is responsible for more than 85 per cent cases of lung cancer. This, he added, can also lead to cancer of the mouth, pharynx, larynx, oesophagus, stomach, pancreas, uterine, cervix, kidney, ureter, bladder and the colon. While urging the National Assembly to hasten the process of passage of bill on the ban on tobacco smoking in the country, he urged Nigerians to support the passage of the National Tobacco control bill as it was in the interest of all especially second hand smokers who are more at risk of infection arising from inhaling tobacco smoke. The Secretary of Social Development of the FCDA, Habiba Kalgo while declaring the workshop open said the decision to ban smoking in public places in the FCT was necessitated by the increase in the number of deaths arising from cancer cases in the FCT. She, however, urged FCT residents to support the ban since they were the second hand smokers who are also affected by the fumes of the products. “Plain packaging” can be a method to reduce tobacco use? International tobacco companies are preparing to mount a no-holdsbarred legal and lobbying campaign to stop Australia becoming the first country to introduce so-called “plain packaging” for cigarettes. A United States-based lobby group took the unusual step of making a submission on the issue last year and the Australian-based American Chamber of Commerce is reviewing whether it will take a position. 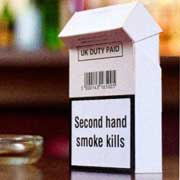 Plain packaging, one of the key recommendations of a report last year to federal Health Minister Nicola Roxon on a national preventative health strategy, would stop tobacco companies using glossy paper, colours or fonts to decorate cigarette packets even in the parts of the package not already taken up by warnings. Brand names such as “Marlboro” or “Peter Jackson” could still appear on the packet but would be much smaller and in a dull, nondescript font. Ms Roxon said she would respond “in a short time” to the recommendations, which include a substantial increase in the excise tax on cigarettes and more funding for quit advertising. A Senate inquiry is also due to start hearings soon on a private member’s bill by Steve Fielding on plain packaging. In a sign of the global interest, Thomas Donohue, president of the US Chamber of Commerce, a major Washington-based business lobby group, made a submission to the preventative health taskforce. “We think that a move to mandate generic packaging would establish a bad precedent for companies from both of our countries,“Mr Donohue said. Charles Blunt, chairman of the American Chamber of Commerce in Australia, said his group was now reviewing whether to take a position on the intellectual property implications of plain packaging. Mr Blunt said the local American Chamber had been aware of the US Chamber’s submission last year but had not joined it. Mr Glantz said internal documents made public during the US tobacco trials revealed close links between Big Tobacco and the US chamber. Tobacco companies in the US are mounting a legal challenge after the Obama administration convinced Congress to pass a law that could allow the US Food and Drug Administration to regulate tobacco products, including by plain packaging. The US Chamber has been split by its opposition to several Obama administration initiatives, and Apple quit the organisation over its stance on climate change. Mathew Rimmer, an intellectual property expert at the Australian National University College of Law, said Australia was one of the first countries to give serious consideration to plain packaging and tobacco firms were concerned that once it was passed in one country, the approach could spread. “There’s an international strategy. It’s part of an orchestrated campaign to squash plain packaging,” Dr Rimmer said. The tobacco industry argues plain packaging breaches trademark law and amounts to confiscation of property without confiscation. But anti-smoking groups say courts around the world have consistently upheld governments’ right to restrict the use of trademarks on serious public health grounds such as tobacco-related death. Retailers in Hong Kong sell cigarettes to minors in the face of tobacco control laws designed to protect children (“Most stores still selling cigarettes to teens”, January 25). This is nothing new. Sting operations in Hong Kong from 1987 have shown the same thing – that retailers are flaunting the law. Bans globally on sales to minors are not effective unless they are given real teeth. The best way forward for Hong Kong is to license retailers to sell cigarettes. If they are then found to be selling cigarettes to those under age, they lose their cigarette licence. It might also be an appropriate time to remove tobacco displays from their prominent positions in supermarkets and other stores. THE LOCAL arm of cigarette maker Philip Morris International expects sales to the domestic market to grow by 2%-4% this year, better than the flat performance in 2009. But it warned that if the Finance department pushes through with a new system to track tax payments, industry-wide sales might fall further, after recording a 10%-15% decline last year. “I’m hoping this year will be better. We will grow in line with the industry … which will grow 2%-4%,” Chris Nelson, Philip Morris Philippines Manufacturing, Inc. managing director, told reporters in a briefing yesterday. Growth will occur because there will be no increases in excise tax rates, Mr. Nelson said. Under Republic Act No. 9334, which set tobacco excise tax rates six years ago, the next hike for vice taxes will be held off until 2011. Rates were adjusted last year. Mr. Nelson said the optimistic outlook would hold as long as the government delays the new stamp-based tracking system for excise tax payments. Early last year, the Finance department’s Bureau of Internal Revenue (BIR) began seeking counterproposals to Swiss firm SICPA Holding SA’s P10.1-billion bid to administer the system. It will require each cigarette pack to have a tamper-proof stamp that can be scanned to check whether taxes were paid. In November, the House of Representatives’ ways and means committee advised the BIR to postpone the bidding, noting that the cost of the tracking system would be shouldered by cigarette consumers and manufacturers. “It would have a severe impact. You can see another [industry sales] decline of 5%-7% or even 13%,” Mr. Nelson said. “The major beneficiary [of that system] is the company that will supply the stamps. The BIR has admitted it will cost P0.52 a pack which [it says] will be passed on to the consumer. That will obviously affect demand,” Mr. Nelson said. Tracking could instead be based an audit of tobacco leaf purchases, he said. The new system will discourage future investments into the cigarette industry, Mr. Nelson said, pointing to Philip Morris’ $500-million expansion of a tobacco leaf warehouse in Subic free port. The firm held groundbreaking ceremonies yesterday for its earlier announced expansion project. The new 20,000-square-meter warehouse at the Subic Technopark will begin receiving leaf shipments by August. It will consolidate storage operations scattered across the region. It will serve manufacturing sites in Tanauan, Batangas, which can churn out up to 35 billion sticks a year, and also in Malaysia and Indonesia. The expansion will increase the firm’s leaf storage capacity to 20,000 metric tons compared to just 6,000 from an existing warehouse in Subic’s Boton area. The new warehouse will have “state-of-the-art” features such as humidity control, fire suppression equipment, and air-conditioning to handle the imported tobacco leaf from China, Indonesia, Thailand and India. “We have space [at our Subic Technopark lot] for an additional facility that can store [another] 10,000 tons. [The decision to expand again] will depend on demand and how we work out our supply and purchasing,” Mr. Nelson said. Aside from selling locally, the cigarette maker also exports to Thailand. Mr. Nelson reiterated that sales there, however, have been falling by as much as 20% annually because of a long unresolved taxation dispute with the Thai government. The Philippines has a case at the World Trade Organization against its Southeast Asian neighbor for its tax regime which allegedly discriminates against foreign-made cigarettes. “It is reasonable to see a conclusion [to the case] in four to five months,” Mr. Nelson said. Philip Morris holds over 15% of the international adult smoking market, excluding China. It invested more than $300 million in the construction of a cigarette manufacturing facility in Tanauan, which became operational in 2003. If you’re thinking about trying one of those electronic cigarettes in an effort to kick the tobacco habit, California Attorney General Jerry Brown has some advice: don’t. Brown has sued the Florida-based electronic-cigarette retailer Smoking Everywhere for making what he says are “misleading and irresponsible” claims that electronic cigarettes are a safe alternative to smoking. He also says the company has targeted minors with its marketing. Electronic cigarettes, or e-cigarettes, are battery-operated devices with nicotine cartridges designed to look and feel like conventional cigarettes. Instead of actual smoke, e-cigarettes produce a vapor from the nicotine cartridge that is inhaled by the user. Smoking Everywhere, one of the largest e-cigarette retailers in the United States, claims in its advertisements that the e-cigarettes have no carcinogens, no tar, no second-hand smoke, and are therefore safe and healthy. Today’s lawsuit seeks to prevent the company from selling its products until there is evidence to substantiate its claims that they are safe. The lawsuit will also require the products to display the state-mandated Proposition 65 warnings of ingredients known to cause cancer or reproductive harm and seeks to prevent the company from making false and misleading claims and promoting the products to minors. In one advertisement targeted to minors, Smoking Everywhere featured a video with radio show host Howard Stern claiming, “kids love ’em.” The products feature flavors that appeal to youth, including strawberry, chocolate, mint, banana and cookies-and-cream. Other ads claim that electronic cigarettes can help people quit smoking. To be advertised as a smoking-cessation device, a product must be approved by the FDA for that purpose. In fact, none of Smoking Everywhere’s products have been approved by the FDA, Brown says. The American Cancer Society, the American Heart Association, the American Lung Association, the Campaign for Tobacco Free Kids and other groups have expressed serious concerns about the safety of electronic cigarettes and urged that they be removed from the market until proof of their safety has been established. Read what the experts say about e-cigarettes.